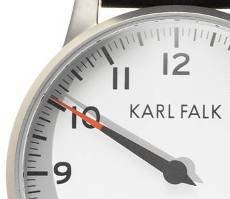 The Karl Falk Watches are made in Pforzheim, Germany. Our watchmakers are a team of highly-skilled watch engineers who specialise in creating precision-made mechanical timepieces. The watches are made using only the best materials. The external elements of the watches are made from brushed stainless steel and the movements are the world-renowned Swiss Automatic ETA 2824 or Swiss Hand-Winding Unitas 6498. All our watches undergo rigorous testing throughout the manufacturing process. The movements are deliberately undecorated so that the aesthetics of the entire watch adhere to the concept of simplicity yet functionality. 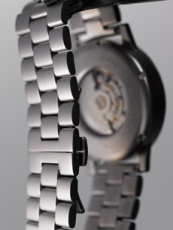 The clasp on the stainless steel bracelet has been technically designed so that the bracelet can be opened and closed with the minimum of effort. All the Karl Falk watches are fitted with a sapphire crystal glass face (scratch resistant), which means the watches can be worn on a daily basis in most circumstances without worrying about potential scratches or damage. The Karl Falk watches are water resistant to 5ATM - an international standard which means that the watches are water resistant under certain conditions such a splashing, showering or swimming. 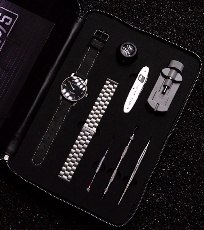 All the Karl Falk watches come fitted with a leather strap (which has side air vents) and come with an additional stainless steel strap and a watch tool kit to enable easy interchanging between the leather and stainless steel strap and shortening and lengthening of the stainless steel strap as required. The tool kit comprises an eye loupe, watch penknife (this has a normal penknife blade, plus a blunter, flatter blade), watch band pin remover, metal tweezers, spring bar tool and screwdriver. All the Karl Falk watches are guaranteed against material or manufacturing defects for 2 years from date of purchase. The signature pieces of the collection are mechanical single hand watches in a range called the 'Einzeiger'. ('Einzeiger' means 'Single Hand' in German). Drawing inspiration from the first pocket watches created in 1524 by Peter Henlein, the Einzeiger watches are a classic design example featuring a range of carefully thought out design details resulting in a precision made watch that is beautiful in its simplicity yet outstanding in its functionality. The Einzeiger watches have a single hour hand which denotes the time in 5 minute intervals with every 15 minutes marked by a more prominent line. The red tip of the hand enables precision time reading. The dial is simple and uncluttered, allowing clear and concise time reading. The glass backs allow the viewing of the mechanics in action.